Our wine hacks are short-and-simple ways to help you get more out of wine without it being an expensive thing to do. Our hacks will always be available as video and text so you can consume the content however you prefer. This is a longer, introductory guide to some basic ways to enjoy a better wine life. It’s our top 3 tips, all of which will appear in longer format on their own in the future. 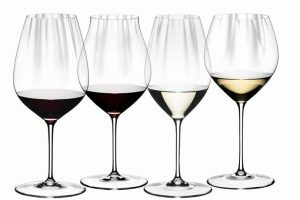 The key here is that you want a tulip shape, so that the crucial wine aromas have (a) the right mix of air and (b) are “funnelled” in the right direction. Which is up your nose! A decanter can help wine breathe and is a really simple way to ensure that the wine has opened up and improved before you drink it. As the video explains, investing in appropriate glassware doesn’t need to be expensive and a tenner can get you going. As a simple rule, we almost always serve white wine far too cold and red wine far too hot. If white wine is ice cold, it mutes the flavour and kills the aromatics. White wine should be roughly 6 to 10 degrees Celsius, which is a lot warmer than most are used to. Red wine should never be at room temperature, that’s a myth, unless your room is in the 18th century. If you’re serving at room temp, it will be 22-24 degrees or more, taste bloated and with high alcohol heat. It should be served roughly 14 to 18 degrees Celsius, never more. Experiencing wine at the real temperature is a revelation – a good wine now tastes great – and doesn’t cost a thing. We’ll explore this in more detail in a future wine hack, but the average price of a bottle of wine in the UK is less than £5. If you’re spending £4-5 on a bottle, by the time duty has been paid, the wine has gone into the bottle, and the retailer has made their margin, there’s probably less than 50p going to the wine itself. If you increase that even to £6-7 pounds a bottle, you’re getting maybe £2 for the wine, or 4x the quality. At £8-10, that’s 6x more on the wine. After about £15, you start to see the law of diminishing returns kick in, but at nowhere in the wine price/quality scale do you see such dramatic results than if you spend only £2 or more per bottle than at this low-end of the range. I thought it was an exaggeration about different glasses making a difference, so I tried a side-by-side tasting of a bottle of fizz. The difference was amazing. Tulip glasses for me from now on! I watched Campbell’s video on the serving temperature of wine so I took a bottle of white out of the fridge & let it ‘warm up’ slightly. The difference was amazing! I’ve drunk Villa Marie Sauvignon Blanc for years but it’s never tasted so good! Campbell and WinedUp rocks!! Thanks Lynne, that’s very kind. But it’s amazing the difference it makes when a good white gets to 8 degrees – suddenly it opens up, new aromas, new flavours, but still plenty cool enough to be refreshing.